The fastest minute of my life! 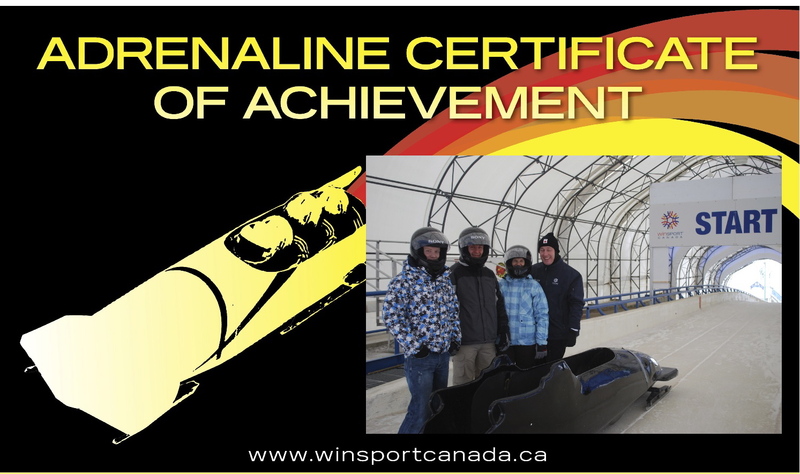 OMG- really there are no words to tell you how amazing the Bobsleigh at COP is – all I can say is go…seriously go….it is so amazing. In 1988 Calgary hosted the Winter Olympic games and that event has left a great legacy of sporting venues in the city. Canada Olympic Park is an active training venue for bobsleigh, luge and skeleton. Our bobsleigh driver told us that the track is still one of the best on the world circuit and it is quite technical so great to train on. Our excursion started at the top of the hill the at the very start of the bobsleigh run and while we did not have to pile into lycra body suits, we were asked not to wear anything big or puffy as there simply isn’t the space in the little metal can we were about to stuff ourselves into! As participants started to pile into the waiting area my sense of excitement and wonder started to turn to a small sense of dread and I questioned if I walk away from this alive. Drivers started to arrive and then the tracks were cleaned and the sleighs brought out, three in total, clocks were turned on and then the helmets brought out – I thought my heart was going to burst through my chest and we hadn’t even moved from our bench! The drivers introduced themselves and gave us an idea of what we would see, hear and feel – sadly my heart started to beat so loudly that I missed the speech – something about keep your shoulders up as the G force is like a 600 pound man sitting on you – oh no – what kind of Christmas present did I buy us??!! As participants start to get ready and times are clocked my nervous anticipation grows back into a keen excitement and finally we hear our names! We are fitted for helmets and we meet our driver, he checks our helmets and gives us some tips for keeping safe and upright- oh and if we have an accident….hang on…ahhhhh!!! So we head out to our sleigh, now we do not have to push or jump in – thank heavens – we pile into the tube which is a circus activity in itself! The sleigh has 3 little boards supposedly are seats and a little rope to hang onto, it is very squishy and I can’t say that I would want to do this with a stranger as I was well wedged in between Darek’s legs! Once we were piled in and the last helmet check was done, two guys started to push us down the track…we were off!! There are grooves in the track that last for only 50 meters after that it is the free ice and skill of the driver. 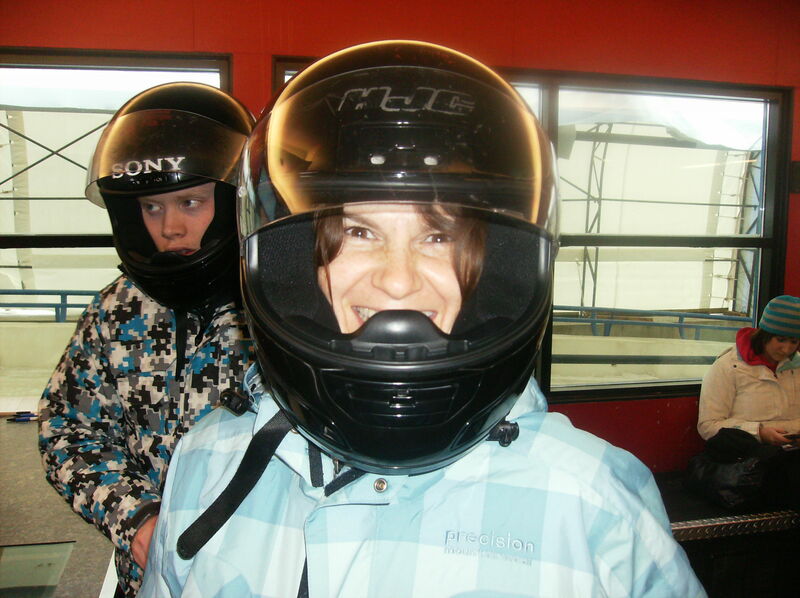 As we start off down the track the first turn is fun, the view is great and I am thinking this bobsleigh thing is easy….then we hit the fourth turn and all heck broke loose! I saw our sleigh go high up on a turn and tried to remember what to do if we flip because I was sure there was no way we were going to stick to the ice – yet somehow we do! Then I hear this bang bang bang bang and I am sure the sleigh is about to fall apart because what on earth could make a noise like that….well the sleigh was fine….it was my head swinging from side to side hitting everything in sight- so much for keeping my shoulders up! Then came the G force, now we were told not to fight it, but, of course I did! It was a ridiculous battle really, me against the awe inspiring force of nature and when it struck again at the next corner I crumpled under its strength. Now I have never actually felt more G force then what you get from taking off in a plane, so 5G’s at 121km was a very humbling and eye opening experience. As we neared the end of the track, our adventure had netted us a top speed of 121.21 km and did it all in 61.07 seconds. When the sleigh came to a stop I was completely euphoric, it had truly been the most amazing experience of my life. Crawling out of the sleigh neither Darek nor I could walk and we were delirious and exhausted! The sleigh was loaded up on the truck and our adventure was winding down, however the memories will live on forever! I am in awe of the type of true athleticism and devotion it must take in order to compete in this sport and I am so proud and grateful to have had the smallest view into this world. 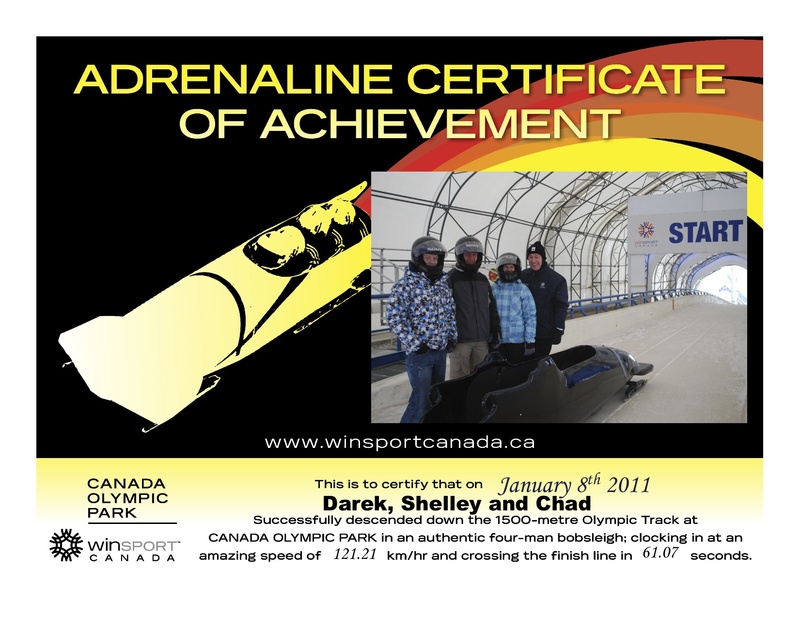 If you are in Calgary in the winter make the bobsleigh at COP your priority – you will talk about it for a lifetime!